Guatemala, before arriving in Honduras. There, as an ENCA representative, I was able to visit several environmental and social justice organisations working in a country wracked by violence and political repression since the military coup of 2009. The first place I visited was COPINH – The Council of Indigenous and Popular Organisations of Honduras, in the West of the country in an area with a large Lenca indigenous population. I was kindly shown around the area of one of COPINH’s most important current struggles by their coordinator Berta Cáceres. Only a few days after I left, Berta was stopped by the military and accused of and arrested for possession of a weapon, which COPINH have condemned as a plant in order to criminalise COPINH and their struggles. Today (June 13th 2013), Berta’s trial for this alleged crime started, amid a large amount of international condemnation for the arrest, and after reading this I would encourage everyone to add your voices to this condemnation, which you can do easily at this Avaast online petition. 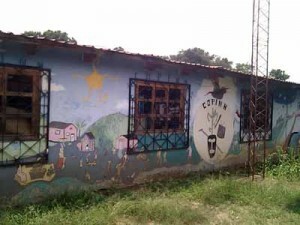 My visit to COPINH was arranged in a bit of a hurry, and when I arrived in their main office in La Esperanza, I was told Berta and most of the organisation were in the Rio Blanco community, several hours away. 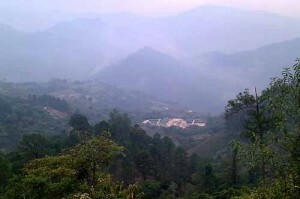 Rio Blanco is a Lenca community, and the site of a new hydroelectric dam project “Agua Zarca”. This project will displace many of the communities, and privatise and reduce access to their water and territory. Like many such projects in the region, it was initiated without their proper consultation and consent, breaking international laws. 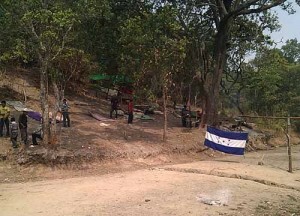 In order to have their voice heard, the Lenca population have since April set up a permanent road block on the entry to the construction site, manned 24/7 by members of their communities, and with support from COPINH. in Honduras, and I scrambled on to a bus to get there as soon as possible. Eventually, after 2 buses, some help from a local mayor and then 2 hitched rides in trucks for the last stretch, I arrived at the site. On the way deeper into the country I passed increasing numbers of heavily armed military check points and patrols. Honduras since the 2009 coup has reverted into one of the most repressive countries in Latin America. Communities increasingly have found themselves fighting land grabbing for large scale capitalist agrobusiness and tourism developments, headed by super rich land owners and politicians. Human rights defenders fighting these struggles are assassinated with appalling frequency, against a background of paramilitary and police deathsquads targeting undesirables with extra-judicial executions. The country´s police and judicial system has become so perforated with corruption both from the military take-over and narcotrafficking gangs, that it has collapsed and impunity runs riot. The country is now branded the most dangerous country in the world, with the highest global murder rate, and only a tiny fraction of murder cases ever being brought to trial. The chaos is portrayed in the media – controlled by the same corrupt land-owners who benefit from the violence – as a general breakdown of order. This is used in the countryside to justify increasing militarisation, with the line between the police and military, and citizen and criminal, increasingly blurred. Where community groups try to fight against more powerful interests and claim their rights, the simplest course of action for these interests is to brand these groups as part of the criminal element they have deployed the army to find. Although it is well recognised that narco-trafficker gangs have infiltrated many levels of the police, it is easy enough to also claim that campesino groups are also working for narco-traffickers, or in possession of illegal arms. In this way, and with the support of the media, the human rights defenders are criminalised and the military presence and control justified. As I saw in Southern Mexico, indigenous groups are particularly vulnerable to being exploited or ignored by powerful groups interested in profit. Living in rural communities, they are not among the intended beneficiaries of large scale agriculture or energy projects – projects that represent large scale investment with huge profits to be made for the big business and politicians that promote them. Meanwhile, the indigenous have legal rights to the land they are on, as ancestral residents, but are easily politically marginalised, and so become targets of efforts to dispossess them of this land, in the process destroying their sources of livelihood and their culture. In Honduras the breakdown and corruption of the justice system has opened the floodgates for this kind of exploitation, and made indigenous groups like the Lenca exceptionally vulnerable. Just like the Zapatistas, the Lenca of Honduras have their own systems of governance and through organisations like COPINH have an international voice. However, where in Mexico the Zapatistas have been able to mobilise themselves and win a fragile autonomy, in Honduras the situation is currently on a knife edge, and the recent arrest of Berta shows just what forces they are up against. On the day I visited, COPINH had invited a group of Garifuna indigenous people from the organisation OFRANEH in the North of the country, for a display of solidarity with the Lenca. 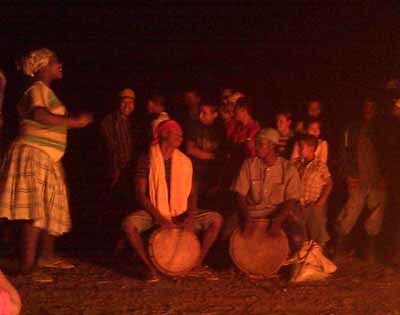 The community manning the road block was therefore particularly buzzing, and I was lucky enough to be present for a drumming and singing session by the Garifuna group (whose ancestors are a mix of indigenous Americans and escaped slaves from Africa). The community has spread certain tents on the embankment next to the road to keep dry from the approaching rainy season, and it was clear the resolve among them that was keeping them there. As a human barrier against the project, they have 4 times been faced with attempts to move them by heavily armed police, who in each instance have arrived in cars marked as property of the dam building companies. I heard a few of the inspiring voices of the indigenous campesinos, including one, Roberto, who talked about the loss of the Lenca language and the critical first step of education for the people in their history and threats against them – reflecting just what the Zapatistas of Chiapas had discussed with me. Among the things that Roberto, Berta and the others I talked to there made clear to me was that they were an unarmed group, despite facing the heavily armed police and military of the region. The military that stopped Berta’s pickup claim that after a search of the luggage section at the back they found a weapon stashed there, apparently carried illegally for self-defense. I rode in the back of the same car and saw nowhere available to hide a weapon. Especially as the pickup was being used to carry many different people all the time, any weapon would have to be so well concealed that it would be completely out of reach for use for self-defense or anything else. Given the success so far of the Lenca road block against the big businesses funding the local police, it appears the authorities there are continuing the practice established in many other cases, attempting to brand Berta a criminal in order to clear out the resistance. Berta´s high profile thankfully gives her some measure of protection from direct violence against her, so they have resorted to this to try to discredit her internationally. COPINH’s fight, and the safety of leaders brave enough to stand up amongst the violence and corruption of Honduras, is extremely important, and I would please invite anyone who reads this to use the link below and add your voice to an international petition for her rights. Her case starts today so these voices are needed now more than ever. Furthermore, ENCA have written a letter direct to the authorities in Honduras denouncing this case, and we are seeking further organisations to have their names added as signatories in support of this letter. The current text of this letter is here in Spanish and here in English, and we would invite responses to email us at enca.info@gmail.com to add further signatories. Click here to sign the Avaast petition, and here is a quick translation of its text.